One of my weird automotive fetishes is the very, very early history of automobiles. I’m talking early, like 50 years or more before Karl Benz’ Patent Motor-Wagen. There’s a lot of interesting developments early on, but the absolute earliest development is very much a mystery. If it’s true at all, it could put the history of cars back as far as 1479. I’ve previously suggested that the earliest example of anything even remotely car-like would be the small, open-steam-turbine vehicle made by a missionary in China named Ferdinand Verbiest. Verbiest’s little model car was built in 1672. 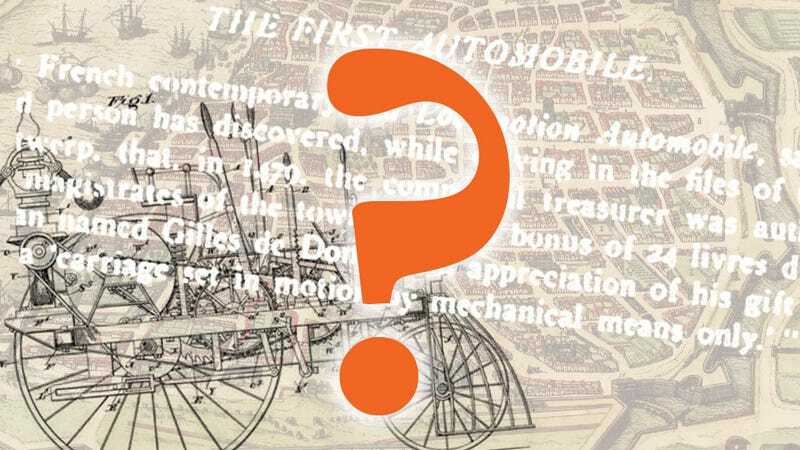 After Verbiest, there’s the first in-depth attempt to design a self-propelled, motorized vehicle, Easmus Darwin’s steam-powered Fiery Chariot, in 1764. Darwin’s automobile design remained just drawings and ideas, and it wasn’t until 1769 when we finally get a working, full-scale automobile, Nicholas-Joseph Cugnot’s Steam Drag. From there, we get into a sort of early explosion of steam-powered vehicles, which would eventually branch off into trains and railroads, and then road-going cars. But before all of these early, embryonic attempts at the automobile, there remains one tantalizing hint about the existence of a mechanical, self-propelled vehicle before any of these. That vehicle is the automobile of Gilles de Dom, which was sold to the city of Antwerp, Belgium for 25 livres in 1479. Everything I’ve been able to find so far comes from that one little blurb from La Locomotion Automobile. It’s the same small, tantalizing set of facts: it was a “carriage set in motion by mechanical means only,” someone named Gilles de Dom built it, and he was paid “24 livres d’Artois” for the ‘gift’ of the machine to the city of Antwerp. That’s a very enticing and painfully meager set of facts. What was this vehicle? What, exactly, did “set in motion by mechanical means” mean, exactly? Would a human-powered vehicle like a pedal-car fit in such a category? For some reason, I don’t think it would. If I may speculate wildly, which I may, I think whatever de Dom built was able to self-propel itself, in some way. It must have worked well enough to convince the city of Antwerp to buy it, so I’m not inclined to think it was some total fraud, like with a hidden, miserable child inside working pedals and cranks. I think we can make a guess as to how such a vehicle could have worked based a bit on what we know of Belgium at the time. Belgium had just come out of its “Burgundian Period” called, by at least this source, Belgium’s Golden Age, which lasted from 1384-1477. This period was one of great economic growth for Belgium, and technologies and luxury goods like clocks would have been in demand, and developed by skilled artisans. I suspect that de Dom was a clockmaker, because clockwork was likely the most advanced technology of the time, especially for storing and releasing energy. Spring-powered clocks were developed in the early 15th century. My guess is that whatever de Dom built, it was a mainspring-powered vehicle that used a clockwork-like system to transfer the energy stored in the spring to one or more wheels. I suspect that de Dom’s vehicle was something like this. Of course, I don’t know for sure, and I’m speculating. I’ve speculated before that a crude steam vehicle could have been built as early as 60 AD, but I think steam power is pretty unlikely. I just don’t have enough information. I’d love to dig deeper into this, but, to be honest, I’m not really qualified on my own. So, this is sort of a plea for help: if anyone is an expert in this period of history, or this part of the world, and may have a suggestion of a good place to start to try and find more, I’d love to know. In the meantime, I’ll keep imagining massive, ornate clockwork vehicles, with huge springs that had to be wound with mules on treadmills, or something like that.